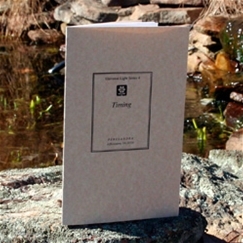 A short but terrific monograph discussing timing vs. time, and timing's place in the evolutionary process of the individual. This monograph is particularly helpful not only in understanding our own timing, but also in understanding how better to relate to others in their timing. I almost daily think of this monograph and it's description of how accidents occur, as I slowly integrate the depth of the information in this pamphlet. Between this paper and the Soul Ray description in the book Dancing in the Shadows of the Moon, almost all of my issues with past lives, why bad things happen to loving people, and where I fit into the Cosmos are answered. I once turned to religion(s) to learn this information, and while they DID introduced me to some awesome White Brotherhood members (like Jesus) on whom I still rely for daily support, the information in this little monograph was missing. My thanks to all who made it possible.